Lamberts Garlic - Lamberts High Strength Garlic 1650mg - closer to nutritional profile of natural raw garlic, with coating to reduce garlic odour. The active ingredients in garlic are believed to be the many sulphur containing compounds, one of which is alliin. Garlic can be taken indefinitely but if you are using it for cholesterol problems then don’t forget to have your levels checked regularly. The active ingredients in garlic are believed to be the many sulphur containing compounds, one of which is alliin. This is converted to allicin when the garlic is chewed or crushed and it is allicin that gives garlic its characteristic smell, and is believed to be the compound responsible for the health benefits of garlic. Garlic is traditionally used for cardiovascular health with evidence that it may help to maintain normal cholesterol levels in the circulation, when part of a healthy low fat diet. Garlic is also believed to make platelets less likely to clump and stick to artery walls. Studies have also shown that it has significant anti-fungal activity and has become popular with many practitioners as part of a diet and supplement regime targeting Candida. 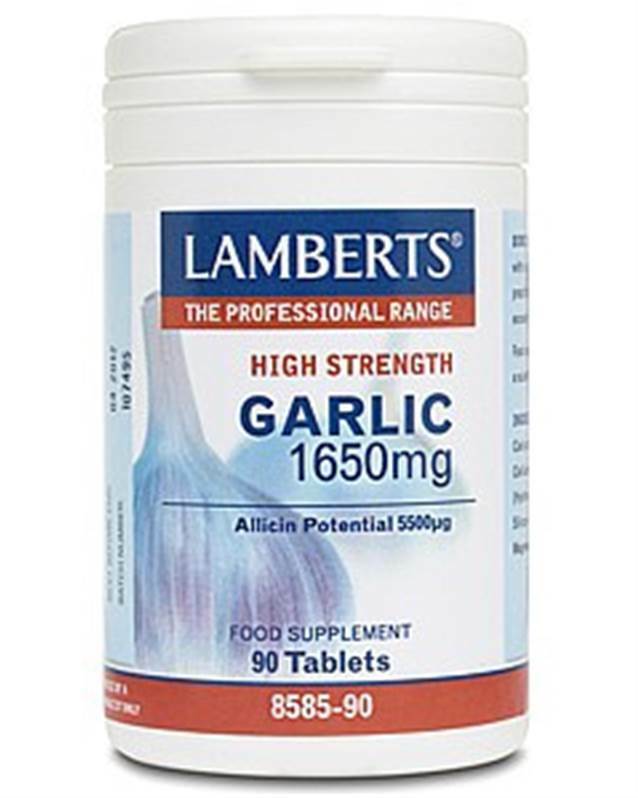 Lamberts® Garlic 1650mg are high potency tablets which are carefully formulated to ensure the ‘allicin potential’ is preserved, whilst the special coating reduces the garlic odour. Each tablet contains a level of garlic, equivalent to 1650mg of fresh garlic, with an allicin potential of 5500µg. The garlic used in these tablets is significantly closer to the nutritional profile of natural, raw garlic than many low priced ‘high street’ brands of garlic. Calcium Carbonate Cellulose Tablet Coating (Hydroxypropyl Methylcellulose) Silicon Dioxide Stearic Acid Magnesium Stearate.